Sales managers, do you know specifically what your sales people are doing everyday to meet their goals for the quarter or the year? Do you know how they are feeling? What do you need to do today to hit your objective for the year? Ontrx measures just that and creates an easy system to help sales people hit their objectives and goals for the year! Not only does it track activity, it tracks the psychology of the user, which correlates to his/her everyday behaviors. For salespeople and managers looking for a better way to stay motivated and accountable to their activities. 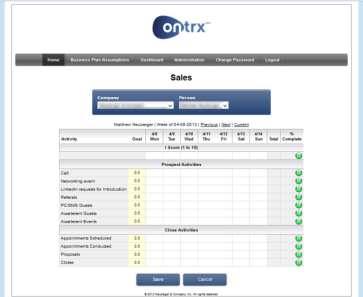 OnTrx provides a proven Internet based system for business plans, tracking activity, personal and professional goals. Average performance increase by 10-15% in the first 3 months! Every one of these categories offers different opportunities to track behavior, measure progress toward goals, and keep a dashboard of whether sales performance is on target. 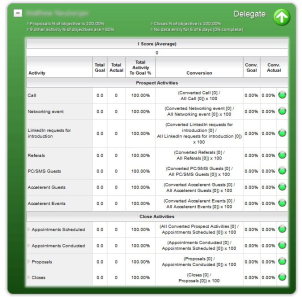 A manager dashboard allows for supervision and oversight of the sales staffs data if applicable. Progress can be viewed at different time intervals including: one week, one month, ninety days, six months, or a year. Each person is designated as a red, green, or yellow field, indicating positive or negative progress. Green is a positive indicator, meaning they are ahead of their objectives. Red indicates that the person is behind in their objectives. Yellow indicates they are right on track. Within each person’s progress, there are statistics on that person’s activity and percentages of what they have completed compared to their goals! Most sales people focus on the past, or lagging indicators. Sales people are reactive but need to be proactive! Ontrx motivates people to be proactive and focus on leading indicators, or the future, verse lagging indicators. Most sales people do not know how to correctly manage their time, but Ontrx can fix that! It will also allow for sales people to budget correctly. Sales managers, how many members of your sales team think they are doing fine, but in reality aren’t? OnTrx will tell you right away!